What do you feel are the main reasons for churches to use duplication? Churches use duplication to expand their reach. They are able to grow the impact of their ministry by handing attendees the event to take with them, and by distributing it to shut-ins or members that couldn’t attend the service, and by reaching out to potential congregants such as new move-ins. The competitive technology, replication, is how most of the CDs you buy at the store are created. It takes longer and it’s a factory-based technology. A church can’t set up a pressing (replication) plant in-house, but setting up and running duplicators is easy and relatively inexpensive. 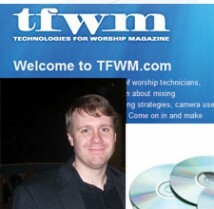 What are some creative ways that you've experienced churches doing CD or DVD duplication with your products? We’ve seen everything from mailers to handouts. But one of my favorites is boxed sets. You can combine several events or lectures together, and combine in other materials such as texts, and offer them up in the church bookstore. It’s a great way to add value, and it extends the shelf life of the product. Perhaps it has shades of Gnosticism to it, but seekers have a certain need for study and knowledge with their worship that is far too often neglected. Religion is supposed to help answer the hard questions about life – and that doesn’t come without personal exertion and effort. A well-prepared disc with supplemental materials can help meet that need. Another idea - at my church we provide a disc of the songs for the Sunday School program to families for children to practice at home and in the car. Besides helping teach the new songs, there are newcomers throughout the year whose children don’t yet know the lyrics that benefit and feel more comfortable when they are exposed to the songs outside of Sunday School. What's the best way for a church to distribute CDs or DVDs- what works and what doesn't? 1. Printing on Sunday. The discs should be pre-printed. There’s no reason that you can’t print ahead of time, only the recorded content is being produced the day of the event. 2. Using a single or a handful of recorders to try to produce hundreds of discs. One recorder takes three minutes to make a full CD – so if you want a lot of discs, get systems with a lot of recorders – usually a tower, not a publisher. 3. Recording to a computer for editing. Of course, for distribution after-the-fact, editing will greatly improve your product. But it’s something you have to compromise on if speed is important. Get a live recorder instead. What improvements have you made to your software interface based on user response? Software development has been our number one focus in engineering this year. We’ve completely redeveloped our software to address specific feedback we received in an outside study of our users. The new software is designed to give power-users all the tools they are used to, while giving the novice or infrequent user a very intuitive interface. Of course, everyone says that about their software – ‘intuitive and powerful’. But I really believe that users are going to love this piece – it’s tabbed and wizard-like, it’s very visual, the controls are very carefully designed and placed to be clear and findable, and it has a dashboard on the final screen that let’s you preview all of your settings – what the label looks like, what you’re recording, how many copies you want, and so on. You can even jump right to the dashboard and design everything from right there. One of my favorite little additions – was the ability to drop a saved job right on the job queue and have it start running automatically. I asked for this feature because of the boxed sets experience we’ve had with churches. Let’s say every Sunday you create a new disc. You can save that job to re-run later. Then if someone wants, for example, all of the April services, you can just drop all of those saved jobs on the queue, and the system will run them automatically. What does the future hold for Microboards? Tons of exciting developments are in progress. Blu-ray is here to stay, the format has finally been chosen over HD-DVD and we are full steam ahead developing BD products to meet the new needs. And we’re working on some exciting Flash solutions (Flash is the storage technology in phones, cameras, USB thumb drives and SD cards) as well. Most importantly, we want to hear what the churches want to see next – because churches are Microboards’ most important customer.